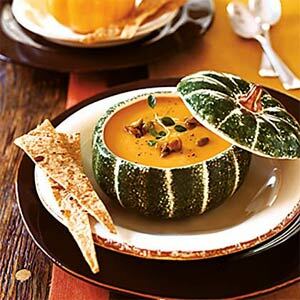 Yummy Pumpkin Soup with Candied Pumpkin seeds recipe. 1. Heat oil in a large saucepan over medium-high heat. Add onion and next 3 ingredients; cook, stirring frequently, about 6 minutes or until onions are translucent. Add calabaza and broth; bring to a boil. Reduce heat, and simmer 20 minutes; remove thyme sprigs. 2. Transfer mixture to a blender or food processor, and puree in batches, scraping down sides. Return to clean saucepan. Reheat soup if necessary. Ladle soup into 6 warmed bowls. Add Candied Pumpkin Seeds to each; garnish, if desired. via Pumpkin Soup with Candied Pumpkin Seeds Recipe | MyRecipes.com.